In 1977, a "Back To St James" celebration weekend was held. For this event an excellent history, St. James 1871 - 1977, was written about the first 100 years of St James which included many references to the nearby town of Lake Rowan. 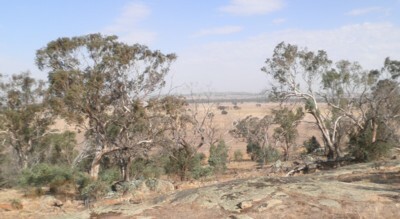 An early section says the original inhabitants and traditional owners of the area were the Kwat Kwat tribe and it tells of the views of an early European local that the large natural wetlands of Lake Rowan swamp constituted an important resource for the aborigines who lived nearby. Blackfish abounded in the Boosey Creek ... with Murray cod in the deeper holes; Kangaroos and possums were in abundance ... there certainly was no shortage of brown snakes and goannas; while wild duck and other aquatic birds were in abundance. 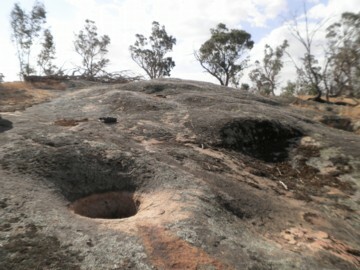 The late Mr Frank Walker spent a great deal of time fossicking around the Lake Rowan swamp area, and the presence of two very large "ovens" at the eastern extremity, and not far from where the creek enters the swamp seems to indicate that this part was frequented by the natives a great deal. ... The Swamp area must have been a hunter's dream for then the swamp itself was much deeper and held water for longer periods than today. In early April, 2018 a small group of intrepid explorers set out to re-discover these wells. Only the large well was found on this occasion. It was thought the other well could be hidden by a large tree which had fallen over nearby. 150 year old water-collection well in extensive sheet of granite. In the photo, the webpage's author can be seen measuring the well's dimensions, in the large sheet of solid granite. 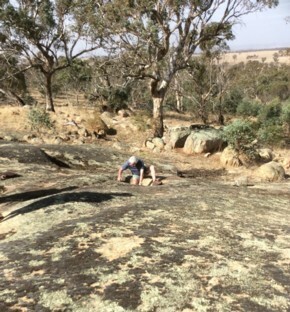 The surfaces of the granite rock are largely covered with moss or lichen, except for where water lays for an extended period. In the well this forms a sharp watermark at the maximum water level clearly showing the level when the well is full. the depth of the well below the neck. On our visit the well was dry with a shallow layer of dirt over the bottom preventing an assessment of the shape of the bottom. However, all the hewn surfaces are quite smooth, so it is expected the bottom would be shallowly concave to allow the last drop of water to be scooped out. depth at neck = 80 cm. Assuming the well is of a cylindrical shape, with the depth from the mouth, the holding capacity of the well is 255 litres, 28% greater than a modern 200 litre, or 44 gallon, drum! How the well was fashioned and how long it took is unknown. Chipping granite with another hard stone would be difficult and slow. 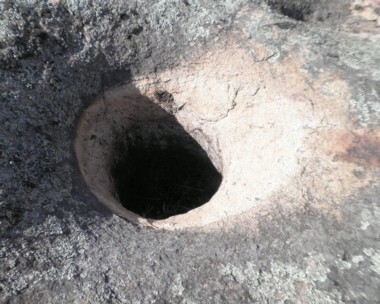 Fires could be lit in the hole to make the granite brittle, but again it would be a protracted process. However it was done it would have taken a very long time. View from the well site looking south. In the distance there is a dark green line, which is Lake Rowan swamp. It looks a long way away in the photo, but it's only about 10 km distant. Behind Lake Rowan swamp, in the distance, is Alexanders Hill where, on the right side, was the Gilbert farm, Frogs Hollow, where Ursula and Jack grew up before the family moved to Tolmie.